← Bank of America to the Rescue? 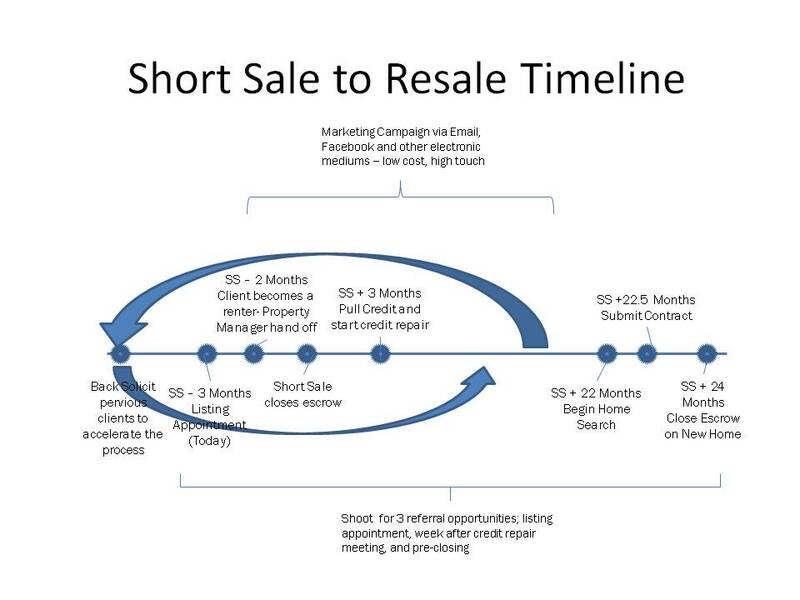 The Short Sale to Resale Timeline was developed to help agents present a game plan to prospective clients during the listing appointment to show a better tomorrow and give them a sense of direction as the next step in their housing life. I have also included a few video clips from our Short Sale Focus Group to give you a sense of what this sounds like rolled out to clients or a group of agents. Our model starts at the listing appointment (today). The overall premise of this model is to show the prospective client that the agent has thought of everything already. Pointing out where the prospective client is on the time line is important, as it illustrates they are just starting on a journey, not ending one. Most clients view the Short Sale as a way to avoid foreclosure and put a graceful end to theirhousing problem. The model’s approach is just the opposite. Your goal as an agent should not be just to Short Sale a house, but to recapture the Short Sale Client as a Resale Client when their situation improves. One of the things the time line accomplishes is that it defines a new goal… a home purchase, not a focus on the current matter at hand, the Short Sale. The next stop on the timeline is the appointment with a property manager. If you don’t have one on your team, find one, a good one, because you are about start a referral train with them. If you do your job right, at the end of the transaction, your Client will become a renter. This is where a good property manager (PM) can help your client find a new place to live without the worry that the PM will poach your client. One of the things to overcome during the listing appointment is the sense of loss that your Client will experience. The loss of a home is a very big deal. Careful substitution of the word House for Home will go a long way to ease the transition. Focusing on the external factors that create Home; such as, friends, church, school, the grocery store where your Husband knows exactly where the dog food is (my personal favorite) are all things that you can take with you. This house is 2200 sq. ft. with the bonus room, 2.5 car garage, and elevation B. Well good news, there are 4 of them just like this in THIS subdivision; the rent on them is $700 lower than your current mortgage payment. You can have your PM “partner” show them the new place and we can draw up a contract whenever they are ready. You can then move on to the next phase, saving money for a down payment on a new house, in 2-3 years depending on credit and market condition. We originally rolled this model out revisiting credit repair during month 18, however, we moved it up to month 3 as it gives you good reason to reconnect with your client after the boxes have been unpacked and they have begun this temporary housing solution. Having your favorite credit repair person or Loan Officer step in here makes another great handoff. Waiting 90 days after COE allows us to see what their credit looks like in its worst state, ground zero of credit, if you will. From here, you and your favorite LO or credit repair person can start the road to credit recovery from ground zero. This is also a great time to ask for a referral. Note that I said referral and not referrals. Relationships are mostly made one on one and most people would be willing to give one name rather than several. Besides, if they had several referrals to offer you, you would already have them. Shoot for one and go from there. The rest of the time line depends on current credit conditions and the ability for your client to save. As this is being published, a person who Short Sales their house is eligible to purchase a new house with a 20% down payment after 24 month of the COE of their previous property. In the event the bar gets moved back to 36 months, push the time line out. If credit conditions shorten to 12 months, act accordingly. Applying this model to your current clientele will allow you to push out the current Short Sale bubble for another 2 years: today’s Short Sales are Resale Clients in 24 months. In the middle of the Model, there is an arrow pointing back to former Clients. This is to serve as a reminder that if you have been in Short Sales for some time; it is perfectly acceptable to revisit your former clients and place them in this program. This will only shorten the time you are able to harvest Resale Clients from your Short Sale Portfolio. At the top of the model we talk about placing your client in some type of drip system (low cost, electronic touch). This model works best if you don’t have to reintroduce yourself to your client. You are their friend. You have helped them out of this mess and are going to get them back to owning a house with “Your” program. Everyone likes to be a part of a program or system. It’s a blueprint to success. The bottom of the model calls for 3 referral opportunities, we already covered one of them. I will save the other 2 for another post, as this one has enough detail to digest. This entry was posted in Uncategorized and tagged Arizona, Colorado, Colorado Springs, Credit Repair, Denver, Flordia, Ft. Myers, Miami, Phoenix, Rich Griffin, Short Sale, Sonoran Title, Time Line. Bookmark the permalink. Great post! We have already seen this happen to many of our past short sale clients! The clients couldn’t be happier either to purchase their new home and the low market values! Plus they send us their friends and family to do the same! Visitors Mayhem Review- the articles on this article is actually a single of probably the most efficient substance that i?ve actually are obtainable throughout. I definitely like your article, I will are readily available again to confirm for new posts. I learned your blog website on google and verify a couple of of one’s early posts. Keep on to keep up the quite very good function. I just additional up your Rss feed to my Msn Information Reader. Searching for ahead to reading much more from you later on!? I real glad to find this website on bing, just what I was searching for : D besides saved to favorites .